We’ll go through adding new custom indicator into StrategyQuant X. Unlike SQ3, SQX allows to extend the program by creating your own custom indicators and building blocks – similar to how you can add new indicators to normal trading platforms like MetaTrader 4/5, Tradestation and so on. We will go through this process step by step to explain everything that is necessary. In the end we’ll have a new custom indicator added to StrategyQuant and you can add it to the list of building blocks for strategies generation. First step is to create our indicator in Code Editor. StrategyQuant internally uses Java programming language, and custom indicators must be programmed in Java. You cannot take your MQL code and just copy & paste it to StrategyQuant, it wouldn’t work. You must rewrite the indicator into Java language. In Code Editor you can create, edit and modify snippets, so we’ll create a new snippet for our new indicator. Once in the Code Editor we click on Create new button on the top toolbar. This will open a dialogue, where we can name our new snippet and choose its type. We’ll name it “ForceIndex” and choose Indicator as a snippet type. After we click OK it will create a new folder ForceIndex under Snippets -> SQ -> Blocks -> Indicators and a new snippet file ForceIndex.java in this folder. 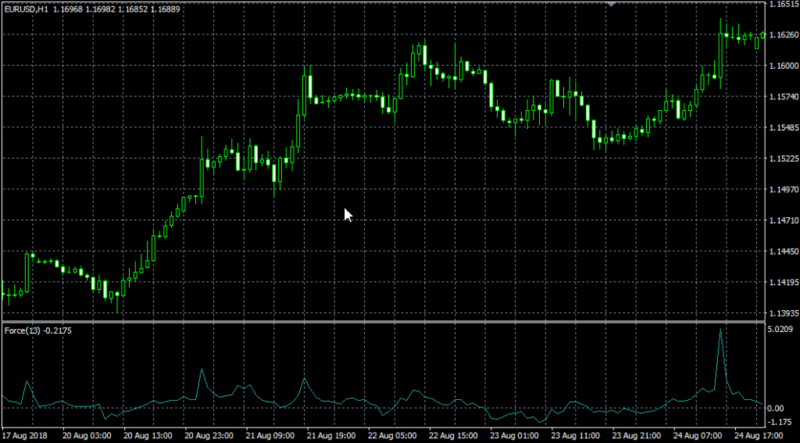 This action created new file for our ForceIndex indicator and opened it in editor. You can see that the indicator is a class and it already has some structure. Secondly, once you create and compile an indicator, you can call it from other methods or indicators by using Indicators.YourIndicator(YourIndicatorParameters). This is how our new indicator is called in OnBlockEvaluate() method. In our case ForceIndex IS NOT displayed on the price chart, so its return type is Number, not Price. We will change it in the next step. This is the source code of the standard indicator template. 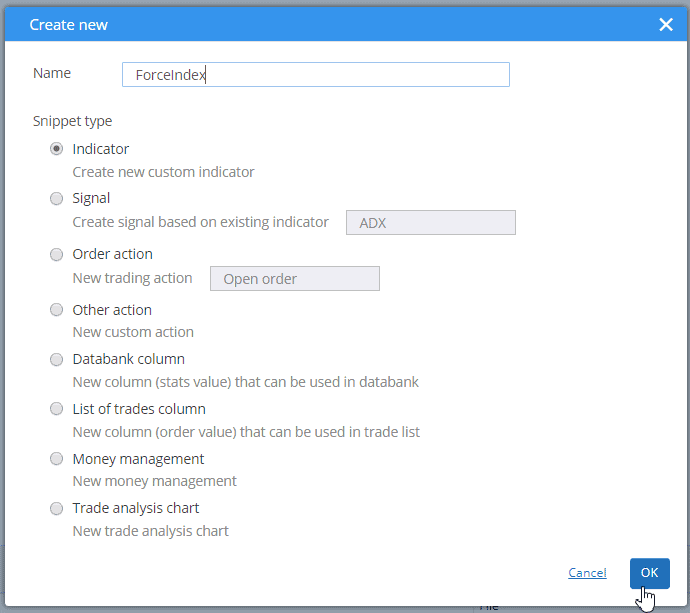 In the next step we’ll show the changes that must be made to implement our ForceIndex indicator. We also changed returnType to Number, because this indicator computes numbers displayed on separate chart, it doesn’t output some price value. However, if you’ll look at ForceIndex MQL source code, you’ll see that it computes its values from one of the price values and from Volume. ChartData type is an object that represents the whole chart – you’ll have access to Open, High, Low, Close, Volume prices in the given chart. If indicator is computed from one price, use DataSeries. If it is computed from multiple prices – for example High, Low, Close, etc. – use ChartData. This is little bit more complex, because we define a selection list (combo box control) as edit control of this parameter. So when editing in Wizard, user will be able to choose from the predefined values. 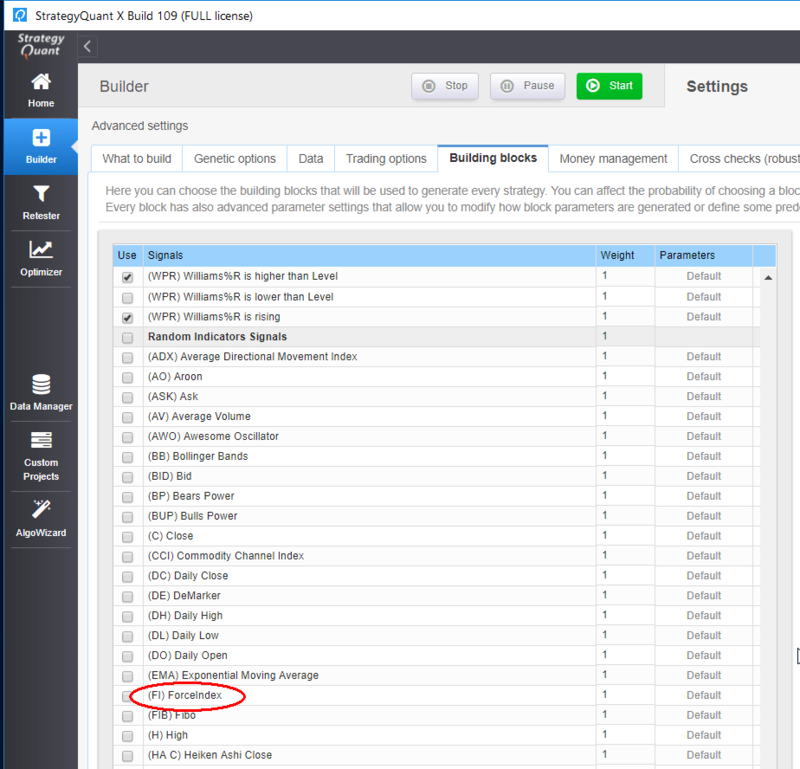 isPeriod=true tells SQ that this parameter is a period – they are handled in a special way, in the Builder configuration you can configure the minimum and maximum value for periods, so SQ needs to know which parameters are periods. minValue, maxValue, step are minimum and maximum values that will be generated for this parameter during the random generation process. The annotation @Output means that this is an output buffer for this indicator. Note that it is of DataSeries type, which means it is an array of double values. In this case, indicator is quite simple and its computation requires virtually only one line in StrategyQuant. We first get price to compute indicator from – by calling Chart.getSeries(AppliedPrice). Then we compute new indicator value as a difference of average of current and previous price value multiplied by current volume. This is all, now when we hit Compile and then restart SQ we will see our new ForceIndex indicator in Random Indicators Signals section. * This method is called on every bar update and here the indicator value is computed. * you need to compute value only for the latest (current) bar. * Trading engine will take care of calling this method for every bar in the chart. * Actual bar for which the indicator value is computed is stored in CurrentBar variable. * If 0, it means it is the very first bar of the chart.